Thanks for visiting Dulles Glass. We hope to service your shower door needs. Before you begin, there's a lot of information to learn about your shower enclosure. Let us help you with our Shower Buying Guide. Know the Basics: What is a frameless glass shower? Is it safe? Durable? Easy to clean? Is it a good choice for me? We'll help you decide in step 1. 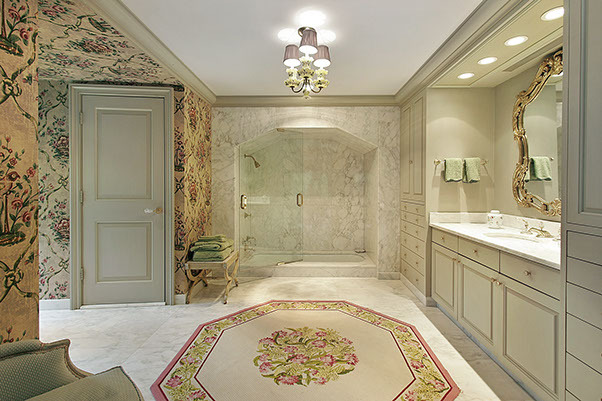 Your Project: Are you remodeling a bathroom or replacing an existing one? This will determine what shape of shower enclosure you can get. Shape: What shape of shower do you want? We'll go over the most common shapes and explain the benefits to you. Configuration: What configuration will you need for your shower? We'll explain factors that influence the cost and look of your shower, like steam shower transoms, they types of walls around your enclosure, and the types of hinges you choose. 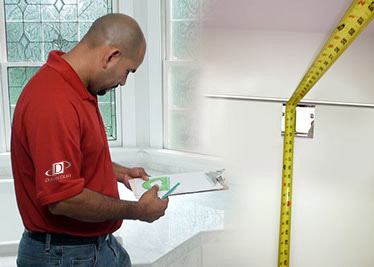 Measurements: We'll go over how to measure your shower space and what you need to know about your shower size. Options: We'll show you the wide variety of glass thicknesses and types; hardware finishes and styles; and other options for creating your dream shower. Making it Happen: We'll explain the process for engaging with Dulles Glass and getting your shower enclosure installed quickly and easily! Installation: Installation doesn't have to be a headache. We'll make the process go smoothly. Choosing a frameless glass shower has a lot of benefits for you as a homeowner. Modern - Both the look and function of these shower doors are a far cry from the shower doors of old. No more screeching and rattling - these doors slide and open quietly. And the look is very up-to-date. Safe - No worries about safety here. Our premium glass shower enclosures are made of thick, high-quality glass - much thicker, in fact, than your standard framed showers. Adds Value to Your Home - Research shows that a bathroom upgrade is one of the best ways to increase the value of your home. Easy Maintenance - Say goodbye to moldy shower curtains and moldy crevices. Dulles Glass shower doors are easier to clean than framed shower doors, since there are no tracks to clean out. And, you can add Clear Shield, a treatment that bonds to glass to make the water "bead" on your shower, keeping it clean and clear. Unmatched Beauty - our customers love the sleek, modern beauty of their frameless glass showers. The frameless look has less visual clutter, showcases your beautiful tilework, and allows for lots of light. Are You Remodeling Your Bathroom or Replacing an Existing Shower? When choosing a glass shower enclosure, the first thing you need to consider is what type of project you are doing. If you are remodeling your bathroom (or building a house from the ground up), you will have a lot more flexibility and choice when it comes to the bathroom enclosure. If you are replacing an existing framed glass shower, you'll probably need to choose a new enclosure that is the same shape and size as your existing one. Regardless of which scenario you're in, we recommend choosing Dulles Glass to purchase AND install your shower, over a non-specialist contractor. We'll definitely be able to get you the right shower, installed perfectly, conveniently and exactly to your specifications. Essentially, the sky is the limit with Dulles Glass! So read on in this guide: we can help you build and specify the shower of your dreams. Next: Choose your shower shape. After you have the "lay of the land," you'll next want to choose a shower type. 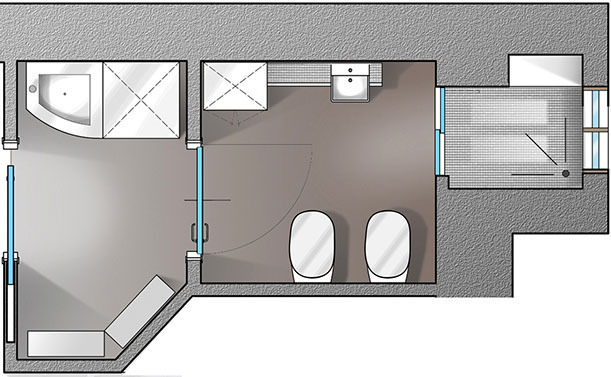 If you're a remodeler, you can probably choose from any of the shapes as you design your new bathroom space. If you have an existing shower, you'll most likely need to choose one that looks the most like your current shower. Here are some examples of the most common shower types. Right Angle or Neo Angle Shower Doors - 90-Degree shower doors have two glass walls meeting at a right angle to form a square or rectangle. Neo-Angle doors are diamond shaped with three glass sides and two tile walls. Single Doors - These heavy glass shower doors are typically the only glass element on a shower enclosure, with tile on the remaining 3 sides, and are perfect for a stand-in shower in a smaller space. Door & Panel Shower Doors - These shower doors are perfect when the opening of your shower is greater than 33 inches. A single door is combined with an additional glass panel, which can be either a full panel or a "knee-in" panel, meaning the wall can extend into the panel. Are you ready to browse or get a quote? Visit our Glass Shower Door section. Once you know what shape your new shower is going to be, you will need to make some choices that will affect the look and the cost of your shower. The following options need to be considered when you're going further down the path of your shower project. All of our shower shapes, from the corner showers to the sliding shows can be built with a full enclosure, or transom at the top of your shower that can be opened to allow steam to escape, or closed, to keep the steam in. You can also choose not to have the transom, which provides an open, airy look. Your new glass shower doors can open to the left or right, and the hinges can be attached to the wall, or to another pane of glass, depending on how your shower is set up. If hinges are attached to two pieces of glass, the cost may be a little higher, because these are a little more complicated to install. For many of the shower shapes, you can have a variety of full and half walls. After you've chosen a shower shape, we'll show you all the most common configurations and you'll be able to choose the one that looks and works best for you. If you don't see the right configuration online, don't worry - we can help you with a custom shower configuration. Explore shower types or talk to an expert. For Remodelers: Measuring your space yourself is less important for you remodelers because you typically have more empty space to work with. 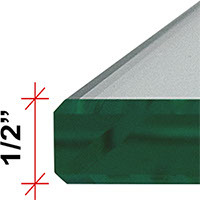 If you're in this situation, we can use the standard size measurements of the shape that you choose when you are completing the quote online or talking to a glass expert. For Existing Shower Replacement: Your quote will be more accurate if you provide accurate measurements of the shower you are replacing. Each shower product page on our site includes a diagram under the "Measurements" tab that shows you how to measure your shower for replacement. But, if you're not exactly sure about this step, you can use standard measurements in our quote form. And don't worry - we'll double-check your measurements as part of our personal service to you - so you'll be certain to get the right size. Are you ready to get started? Get a Quote now! Dulles Glass showers are all made from thick, high-quality glass, available in several thicknesses for your shower enclosure. 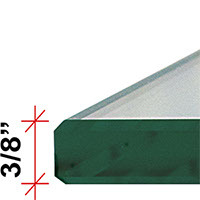 Three-eighth-inch thick glass is the smallest thickness size that can be used in frameless showers to assure sound, quality construction. It's also more budget-friendly than half-inch glass. However, it's still thicker than your average framed shower enclosure glass, and it's strong and sturdy to boot. Choosing this option will add some cost to your overall budget, but many customers like the added safety and quality that this glass thickness provides. Our standard clear glass is the most budget-friendly option for your shower enclosure. HDglass glass is the highest-quality, clearest glass you can buy, and is a great choice for your shower. This option does add a slight cost to your project. Etched glass provides a little bit more privacy by obscuring the view through the glass, and is a unique and attractive option for your shower enclosure. One exciting option to choose is your hardware finishes. We offer a wide variety so you can be sure to match the rest of your bathroom décor. When planning your frameless shower, you can choose either to build your frameless shower with premium-grade metal clips or you can choose to build it with U-channels -- long rails your glass panels sit in. Metal clips are used to create a true frameless appearance. These two-inch heavy clips secure the glass panels of your frameless shower to a floor, wall or another glass panel, preserving an all-glass look. They are also very hygienic, as the clips go all the way through the glass. This option will add some cost to your shower enclosure. 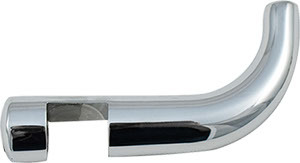 U -Channels are long rails that your glass panels sit in. While these cost less than the metal clips, they do not give you as sleek of a frameless look. Protect your shower glass with ClearShield, an effective treatment for your glass that ensures your shower or bath remains as clean and shiny as installation day. Get a Quote Online - fill out our easy-to-use, 4 step quote form that will lead you through your shower selections and get you a fast, easy quote. Schedule an Appointment - Have an expert from Dulles Glass come out to your house, get measurements, and walk you through your shower options. This is a low-fuss, no obligation way to feel good about your shower options. Visit a Showroom - We have two conveniently-located showrooms in Manassas, VA and Silver Spring, MD where you can come to look at our high-quality showers and talk to glass experts. One thing that sets Dulles Glass apart from regular contractors is that we fabricate and install your glass shower enclosures ourselves. We don't send it out or get it pre-made, and we don't sub-contract the installation. What does that mean to you? We rely on ourselves to get your shower enclosure just right. We're accountable for making sure your shower is put together correctly and installed seamlessly and perfectly in your home. No worries, no stress, and no fear - we've got you covered in this area.